The recent IZES paper on proposals for Germany’s future energy policy provided an overview of how the switch to reverse auctions might look based on experience in other countries. Craig Morris says the outcome of the switch is obvious. Does it match the German government’s goal? The study focuses on three countries that have employed reverse auctions for renewables: Brazil, which drew international headlines for its recent round of bids that produced some of the lowest prices for wind power ever; and France and the Netherlands, which IZES says have markets and goals more similar to Germany’s. One major discrepancy in Brazil was that bidders had to place a deposit of 10 percent of the project’s cost upfront. The goal was to ensure that firms lacking liquidity would not participate; one undesired outcome of bidding processes is when contracts are awarded, but nothing is built. Sometimes, the firms turn out to be too small to complete the project, or they may have offered a price that turns out to be unfeasible; at other times, firms win awards and then drag the project out as long as possible because the technologies get cheaper all the time (thanks primarily to feed-in tariffs in countries without reverse auctions – see below). By requiring a deposit, Brazil aimed to ensure that projects went ahead on schedule. In 2012, only 65 percent of the projects were completed on time. The drawback of this requirement for a deposit was that even more firms were shut out from the outset. One goal of Germany’s Energiewende is to promote SMEs and citizen co-ops, but that was not a goal in Brazil – and diversity among market players is not what reverse auctions produce well anyway. Either Brazilian energy experts do not know about the effect of auctions on smaller bidders, or diversity among bidders was not a goal. It should also be pointed out that the round of bidding in the fall of 2013 did not elicit a single submission for photovoltaics because the starting price was far too low. Apparently, this outcome surprised the officials, so that a new round of bids is now being conducted solely for PV. In their bidding processes for PV arrays larger than 100 kilowatts, the French system requires an estimated submission period of 5 to 6 weeks (quite a lot of time to invest in a bid for a contract you may not be awarded), and more than half of the volume went to no more than 10 bidders in each of six rounds of bidding. 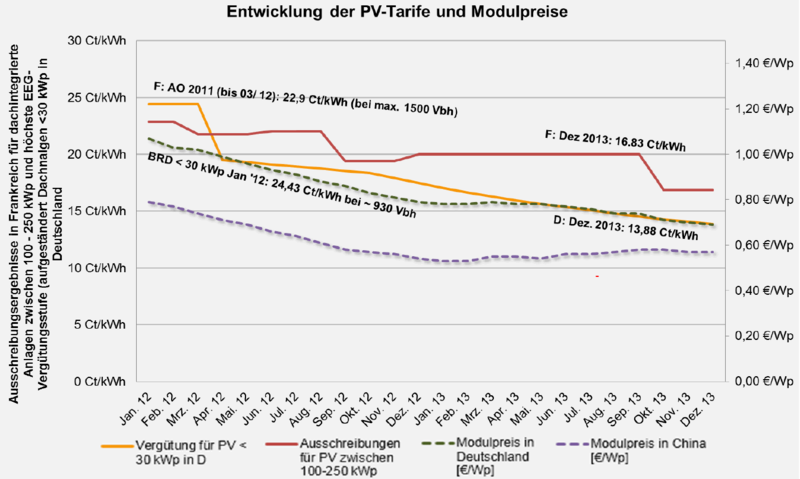 Furthermore, IZES points out that French auctions somehow managed to reduce the price of PV less than German feed-in tariffs did during the same timeframe (see chart below). If the lowest price per unit is the goal, then the French policy option would not seem to be the better model. The Dutch are having trouble simply getting stuff built. Only eight percent of the biogas projects awarded contracts since 2011 have been completed – and a whopping 98 percent of the PV projects that won auctions last year were apparently not built even though they had to be completed within a few weeks in compliance with auction rules. The reverse auctions are working better for onshore wind, and yet the government is not nearly on target to reach its goal of an additional 12 GW of wind power by 2020. In 2008, the country had 2.3 GW; at the end of 2013, around 2.6 GW. So while Dutch wind farms are being built more or less on schedule, not nearly enough is being auctioned off. Is the Dutch government intentionally waiting to build everything near the end of this decade, or are they just asleep at the wheel? In an international comparison, reverse auctions seem to be a useful way of slowing down the transition to renewables and ensuring that a small oligopoly of firms dominate the market. The likely outcome of a transition from feed-in tariffs to reverse auctions in Germany is a transition from projects driven by citizens, energy co-ops, and small businesses to a sector defined by dirigiste government officials awarding large contracts to big companies in processes that are, by definition, not open. If this is the German government’s new goal for the Energiewende, then that goal needs to be clearly stated. If not, then why pursue the wrong policy?